Recently, many companies have begun using eddy current to measure conductivity of non-ferrous materials. In many cases this is their first encounter with eddy current. The author, over the last eleven years, has worked with many of these first time conductivity meter users. It is hoped that this paper will help them to make more consistently accurate readings through a better understanding of the technology and its limitations. Eddy current is a non-destructive testing technique that utilizes a probe or coil to establish a small alternating electric current within a test material; this is the eddy current which gave the test method its name. The instrument probe or coil is affected by the eddy current. By interpreting the affect of the test material on the probe, information can be obtained about the material’s permeability, mass and electrical conductivity. For the purpose of this paper, we will deal with electrical conductivity of non-ferrous alloys. Even though we are not dealing directly with mass, it is important for the user to be aware of the possible affect of this variable which will be discussed later in this paper. Electrical conductivity is a property of metals that can be used to sort various alloys, or give an indication of the heat treat condition of an alloy. In materials to be used for electrical conductors, the electrical conductivity is a vital direct indication of the material’s ability to perform efficiently. Heat treatment affects both the hardness and electrical conductivity of most aluminum alloys. Although the primary purpose behind heat treatment is to control hardness of the alloy, measuring the hardness with a contact tester is slow, can be difficult on large or complex parts, and may produce undesirable surface blemishes. Eddy current conductivity testing provides a rapid portable indirect measurement of hardness, provided the alloy is known. Some of the terms used in conductivity testing are unique to the field, or at least not covered in most dictionaries. IACS stands for the International Annealed Copper Standard. This is a measurement scale which compares the conductivity of materials to that of annealed copper. The readings are expressed as percent IACS. Since some materials are better conductors that copper, readings over 100% are sometimes encountered. Accuracy is defined in the dictionary as freedom from error. For our purposes, a better word might be uncertainty. There are many variables which can affect eddy current readings. Every measurement has some amount of uncertainty. The accuracy of a reading is the sum of the uncertainties of every test that led to the final result. Fortunately, the documentation for traceable standards includes the accuracy. This has been computed by the maker. Most instrument manufacturers list the accuracy of their instruments. Resolution is the limit of how small of an incremental change can be measured. For example, most digital conductivity meters display one digit after the decimal place. Therefore such an instrument would have a resolution of +/- 0.1% IACS. Resolution is now a measure of accuracy, but it is one of the factors which limit the accuracy of the instrument. A traceable standard is one whose value was established using standards and instruments whose accuracy is traceable to the National Bureau of Standards. A primary standard is a traceable standard whose value has been established by a means other than eddy current. The accuracy of primary standards is limited by several factors. The procedure most frequently used is described in ASTM B 193. In short, a precisely machined bar of uniform material is connected to a Wheatstone bridge, while precisely maintaining a constant temperature. A DC electric current is passed through the bar to determine its resistivity. The accuracy is limited by the uncertainty of the dimensional measurement, accuracy of temperature control, and accuracy of the precision resistors. At present, the best obtainable accuracy is 0.1%. Primary standards are not used for field calibration of eddy current meters, since the bars are quite large. If they were cut into smaller coupons, they could never again be recertified as primary standards. Secondary standards are made by eddy current transfer from the primary standards. The best current technology uses a precision impedance analyzer to compare the values of the primary standards to sample coupons which are kept in a precision temperature controlled oil bath. The best accuracy currently available produces an accuracy of 0.35% for the best available secondary standards. The value of a tertiary standard is established by eddy current transfer from a secondary level. Since the best secondary standards have an accuracy of 0.35% and the best eddy current transfer has an accuracy of 0.25%, the best tertiary standards can be no more than 0.6% accurate. A standard whose value is established be eddy current transfer from a tertiary standard. This is seldom used because of the inherent lack of accuracy. There are six factors which affect the accuracy of eddy current conductivity measurements. These are temperature, lift-off, curved surfaces, edge effect, materials thickness, and cladding. 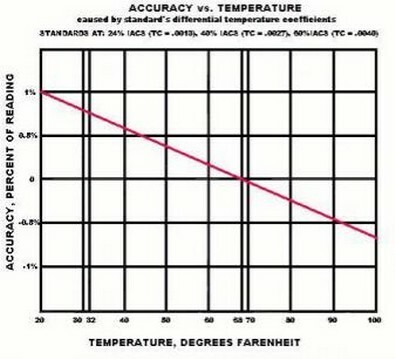 Temperature is probably the most important variable that is under control of the instrument operator. The conductivity of most materials goes down as its temperature goes up. The rate of change is different for various materials. The conductivity value is nearly always expressed as the value at 68o F (20o C). For example, an aluminum alloy with a temperature coefficient of .0029 and a conductivity of 43.42% IACS at 68o F will have a value of 42.6% IACS at 80o F. This is a change of .82% IACS or 1.9% of the actual value. 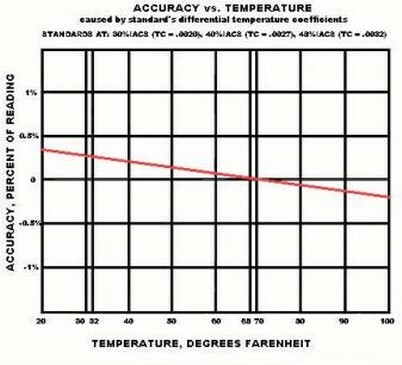 Since most readings are done at a temperature other than 68.00o F., some correction method must be used to obtain the correct value. On conductivity meters, such as the Centurion NDT / Magnaflux FM-140, field calibration is done with two standards, one above and one below the measuring range. Figure 1 shows the change in conductivity for an aluminum sample with a conductivity fo 40% IACS and a temperature coefficient of .0027. It clearly illustrates a significant decrease in conductivity as the temperature increases. For this material, a change of only 2 degrees Fahrenheit makes a change of more than .1% IACS. The information in these illustrations is based upon the actual thermal coefficients and IACS values of Boeing standards owned by Centurion NDT. The IACS values have been rounded for simplicity. When calibration is done using standards at the same temperature as the test material, a compensating change in conductivity occurs within the standards. Figure 2 illustrates the change in conductivity of the standards as well as the test material. In this illustration, the lines are not parallel, but rather coverging as the temperature increases. However, the three lines will not meet at the same point. This will produce a small predictable error since the material value does not maintain a constant relationship with standards. Figure 3 shows the error, in percent of reading, for our material over a range of temperature when using standards of significantly different value and material. 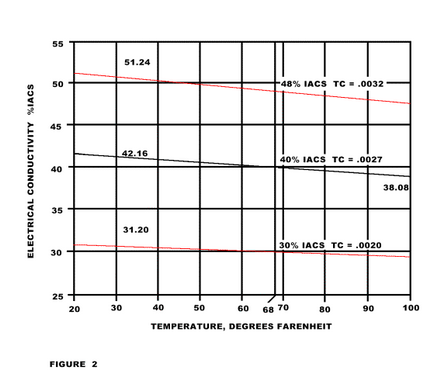 Figure 4 shows the reduction in error which results from using standards with values and temperature coefficients closer to the material under test. The following suggestions will help reduce temperature related errors. The material should be at a stable temperature. Avoid taking readings in direct sunlight or shortly after material is transferred to at heated of air-conditioned location. The instrument and standards should be at the same temperature as the material being tested. The eddy current probe must be in intimate contact with the material being tested. However, since eddy current uses a magnetic field, a thin non-conductive coating can be tolerated by most instruments. This will allow testing through non-conductive paint or oxidation. To confirm proper lift-off suppression, a piece of paper or tape can be used as a shim. There should be no change in reading when the probe is directly on the materials, or reading through the shim. Some instruments have a front panel control to facilitate user adjustment for lift-off. Curved surfaces may affect the reading, since only a portion of the probe can be in contact with the material. The lift-off compensation on most conductivity meters will allow accurate readings on surfaces with radii greater than three inches. Surfaces with small radii will alter the indicated conductivity value. However, in the radius is constant in the area being measured, and the probe is reliably repositioned on each part, a correction factor can often be used. Instrument readings are affected when the probe is placed close to the edge of a part. As a general rule, the test area should be at least twice the probe coil diameter. For smaller areas, the probe must be fixtured to provide repeatable results; a conversion factor can then be developed. Eddy currents penetrate a small distance into the material. For aluminum alloys and instruments operating at 60 KHz or higher, this is not a concern with materials over 0.060 inches thick. Since eddy current is basically a surface inspection, the results are affected by cladding. Typically, readings will increase with the cladding thickness. Since the reading is affected by the conductivity of both the base and cladding materials as well as the thickness of the cladding, it is sometimes necessary to remove the cladding from a small area to accurately measure the conductivity of the base material. When performing eddy current conductivity measurement to a manufacturer’s specification, the details of procedure and accuracy are usually specified. For further detailed information on this topic, the following publication will be of help.